Nestle in clouds with the Urban Habitat Kids Bliss Comforter Set. 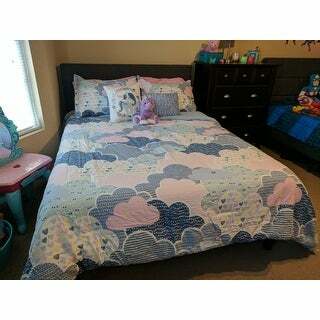 The comforter showcases various cute and fluffy clouds in a colorful a palette of blue, purple, pink, and white. Within each cloud is a playful design that adds extra charm and dimension to the bedspread. The comforter reverses to a solid periwinkle blue. One pillow features all over ruching and the other features an embroidered unicorn. Made from 100-percnet pre-washed, pre-shrunk cotton, this comforter set is hypoallergenic and bed-ready right out of the package. Love this bed spread for my three year old! It feels very well-made and we loved the addition of the unicorn and ruffled pillows. The twin size does contain only one pillow sham. My only issue with this comforter is the fact that it feels like a fine grit sandpaper. It isn’t soft at all. It is a very rough cotton. I can’t use the pillow shams on my daughters bed because they are too rough feeling on your face and washing made no difference. Other than that the design and colour combination it is beautiful and looks great in her room. Also washed on delicate cycle cold water and dried on low but cotton inside bunched up in one spot. This is the sweetest comforter set for a girl I've ever seen. The pinks, lavenders, and blues are beautiful, as is the cloud pattern. Cotton fabric is also a plus. The comforter looks exactly how it’s pictured. It is not a heavy comforter but very light weight. It’s similar quality to the children’s comforters you would find in target. I would recommend this comforter. I got it for my daughter who loves unicorns. The design and quality of the comforter is really good. I was looking for 100%cotton to give comfort while sleeping and it is exactly that. Very soft and cozy. My girls loved these for their new room. The colors are unique with the various shades of blues and purples and it definitely gives the room a cheery appearance. They are a good size for a full and not too short on the sides. I would have rated it 5 stars but I thought the shams were a bit thin and almost see through compared to the quality of the comforter. Besides that we are very pleased with this bedding set! I searched and searched for bedding for my daughter that was girly but not overwhelmingly so. This bedding is perfect. The colors, pattern and pillows are beautiful. It is warm but not too heavy. I would be happier with a thicker fabric as I feel it would last longer, but this is holding up well and I've had it over 6 months. The fabric is also pre washed and shrunk so it is ready for sleeping straight out of the bag. I would definitely buy this again! Very cute print. Will look great in my twins’ girls blue room. I purchased this set in full-size for my daughter’s bedroom in our new house. I can’t speak as to how it holds up because she hasn’t started using it yet, but it seems like very nice quality and it’s really cute! It’s whimsical and fun without being too over-the-top loud “kid bedding.” The bedspread feels soft and full and the embroidery on the unicorn pillow is done well. Would definitely recommend. LOVE this comforter. It is soft and not too heavy. I loved it so much I almost bought it for my other daughter as well, but we went with another theme. The colors are great and it has help up nicely! Heavy comforter. Great quality. Would absolutely buy again. I love this set. This is a beautiful comforter set. The fabric is great. It's is not thin, which was a plus for me. It looks just like the picture. the extra pillows are great and defines the set more! Comforter set is as cute as the picture! Very good quality as well. My daughter was very happy with it. The sheets are not included. Please see item # 23225457. "Is this am actual comforter or a Coverlet? " It is called a comforter. "What is the comforter filling? Also, is this a periwinkle or a true blue on the back?" It has 220 gram polyester filling. As far as filling, I'd see product description for exact fabric but it is fairly thin like a quilt not a thick comforter type. As far as color, it's more periwinkle I would say. It has a lighter blue in it as well as a light purple, pink, a small amount of yellow and darker blue. The darker main blue is a true "on the navy side". I was unsure myself but took a chance and ordered it and I love it!